Feng shui transparent template 24 mountains with English names spelling; it is 11.5 cm in diameter. It is in round shape. It is easy to use. It is much easier to use than a square one. This feng shui transparent template with 24 mountains is one of a MUST to have Feng shui tools. It is for anyone who is interested in Fengshui. This feng shui transparent template with 24 mountains is used on a floor plan to indicate the qi from 24 directions, 24 mountains or 24 sectors. It is made of transparent plastic with 11.50cm in diameter. It has 7 rings color coded. Each of the rings has different function. This round plastic Feng shui transparent template ruler has 7 Seven Feng shui LuoPan rings. These seven rings are the popular rings on any feng shui Luopan. Both the Sanhe and San Yuen LuoPan will have these seven rings. The Taiji point – the Taiji point is also known as the center point. It has a small hole at the center of the template. The Early Heaven Bagua arrangement is first layer in Feng Shui. The Later Heaven Bagua arrangement with English names, in traditional Feng Shui, the Early and Later Heaven Baguas work hand in hand. This is called “Double Heaven Technique”. 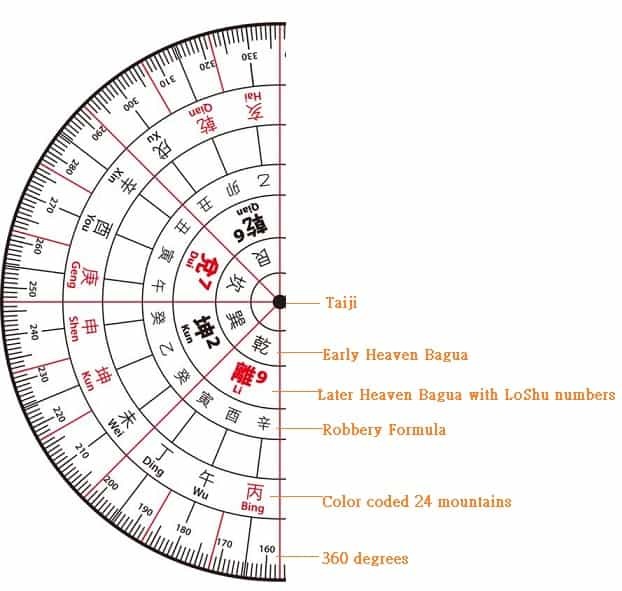 The Natal LoShu number arrangement, after sometime, the Loshu number at each sector should be memorized by heart. They are very often used in Tradition feng shui to identify different combinations. Robbery Sha formula, the Robbery Sha formula is an important formula to find out at which particular area in relation to the sitting has potential Sha Qi (Bad energy). 24 Mountains with English names, some of the mountains are in red. They are the Yang Mountains. The color coded can assist some feng shui formula’s calculation. The seventh ring: The 360 degrees, it is made easier for reference in degree. The price is A$29.8 each including handling and postage to anywhere in the world.